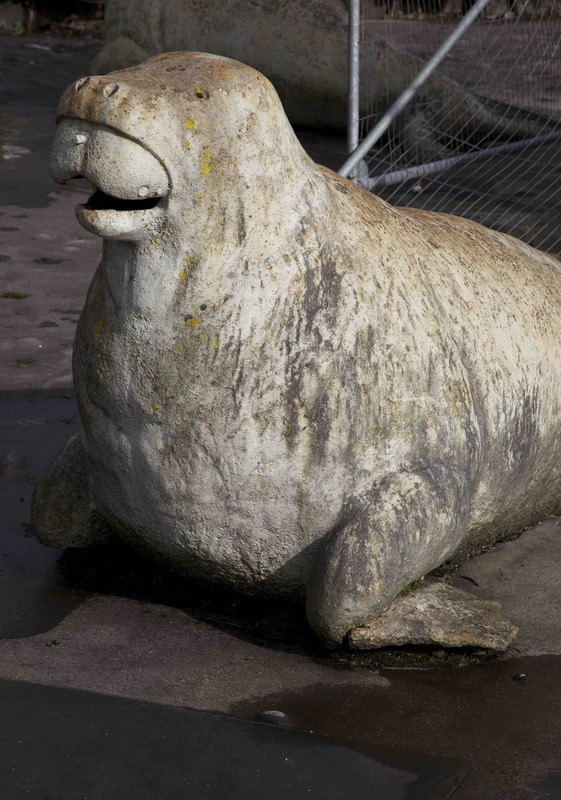 Paisley is a satellite town of Glasgow that has all the characteristics of post-industrial grimness: soot-blackened buildings, ruins of its once-thriving textile industry, and a grand Victorian High Street now in sad decline, with boarded-up shops the most recent reminder of its precarious fortunes. I headed out there on a train from Glasgow Central on a bright March morning; fifteen minutes later in Paisley, rain-sodden clouds had gathered, whipped up by a ferocious westerly. 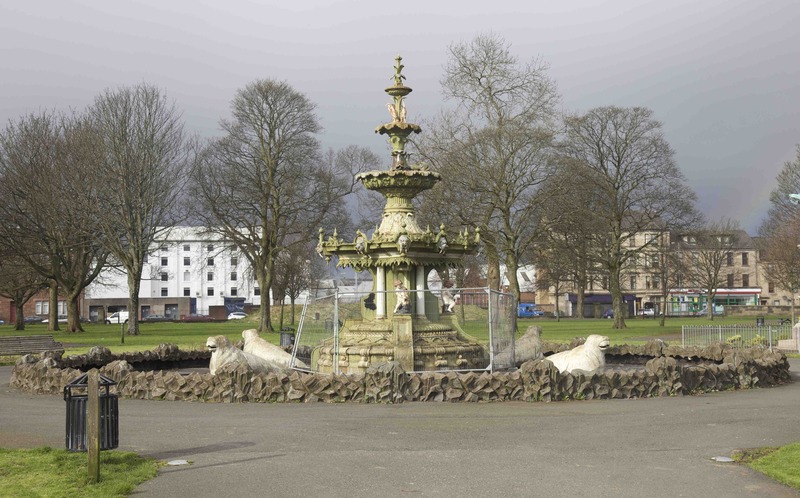 I had come to see the town’s Fountain Gardens, a philanthropic gift to the citizens of Paisley in 1868 by a local resident, Thomas Coats, made wealthy by the manufacturing industries that had seen the town grow rapidly in the mid-19th century. 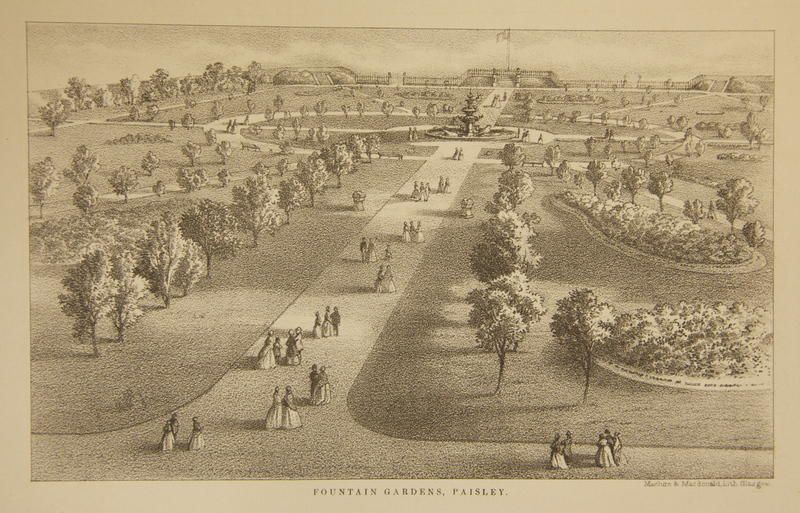 Coats had purchased the gardens from their private owners and then remodelled them as a civic space: ‘where the toil-worn mechanic may breath the fresh air’ or more refined citizens be reminded of the ‘public gardens of continental countries’. Such an ‘interchange of civilities’ between classes would enhance social harmony in the town, guided by the example of Coats himself in his munificent act of generosity. This kind of private philanthropy was common in Victorian towns and cities, particularly where industrialisation had perhaps led to feelings of guilt among the wealthy manufacturing elite about the often appalling social conditions of their workers. 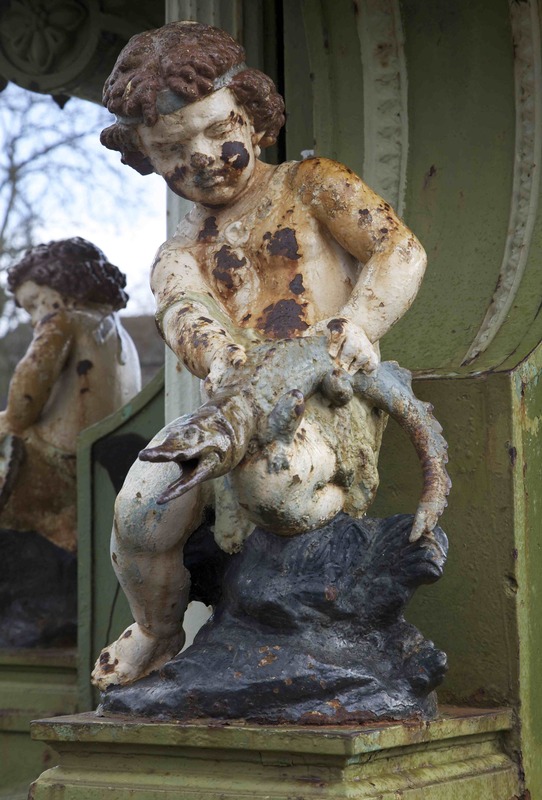 In Fountain Gardens, Coats wanted to create a new form of civility – a reconciliation of worker and master – symbolised by the central feature of the gardens, the fountains themselves. 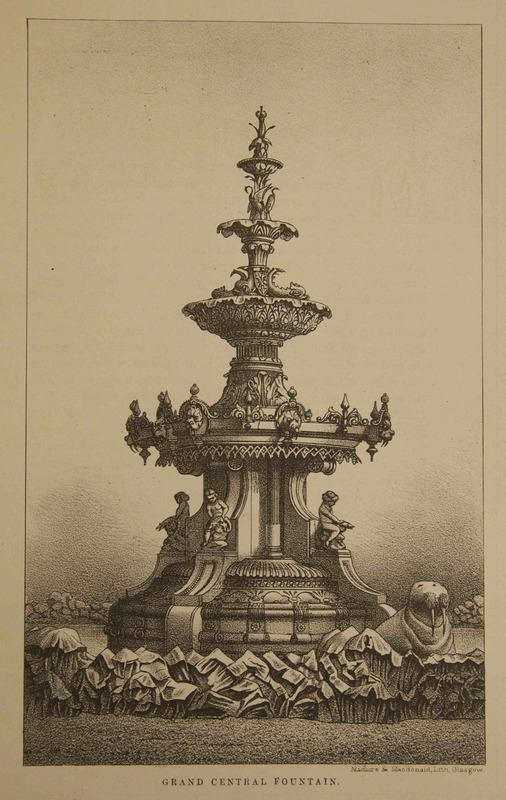 As described in a lavish publication celebrating the opening of the Gardens, the fountain was an exceptional example of ornamental cast-iron manufacture, made by the Sun Foundry (George Smith & Co) in Glasgow and unlike any other example produced before or since. Described as ‘Franco Italian’ in character, the fountain was 30-ft high with a 12-ft basin on the ground supporting four further basins, divided into sections by four heavy buttresses and a series of ‘bold and well-defined’ curves. As described in The Builder, the wealth of ornament was extravagant and included, from bottom to top, a circular border cast in imitation of huge blocks of rock thrown together, inside which sit four life-size representations of walruses; in the basin above are cherubs holding crocodiles; those above are encrusted with crystals, floriated capitals, sea-horses, bulrushes, and dolphins and, at the top, a group of herons surmounted by a cluster of aquatic plants. Such extravagant decoration was viewed as ‘creditable to the taste and liberality of Mr Coats and the artistic skill of its constructors’. 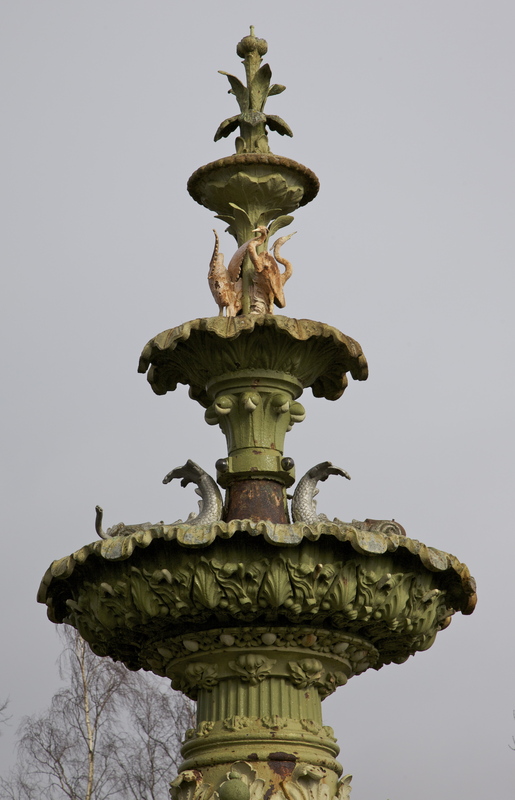 In addition to the gardens functioning as the ‘lungs’ of the town, the ornaments of the fountain would provide both a lesson in artistic taste and also a utopian representation of nature and industry reconciled, mirroring the social reconciliation that was anticipated in the Gardens themselves. Those who attended the opening of the Gardens on 26 May 1868 seemed to confirm this. The whole town rested for the day, held together in common ‘by one strong swelling impulse to do something in the way of expressing a great common feeling’. All political and personal differences were put aside and the townsfolk acted ‘harmoniously’, joining a procession through the town that culminated in the opening of the Gardens and the turning on of the fountain waters. the fountain has had a complete overhaul and is now in full working order and worth another visit and a more favourable review !